for solving strain equation: solve linear system Ax=b for x. This is an optimization parameter for the PCG_Kent algorithm. It is used as a preconditioner for solving the system of linear equations A.x = b, where the matrix A is sparse, and A.x=b is solved with BiCGSTAB or another conjugate gradient method. For large matrices a smaller value than 10 is recommended. ILU(0) has the same number of offdiagonal matrix elements than the original sparse matrix A. Sets up symmetric (upper half of matrix) or nonsymmetric matrix (full matrix) assuming that the matrix is symmetric. The latter option also allows that the matrix is not symmetric. Obviously, the required storage is twice as much but the matrix-vector products are faster. If periodic boundary conditions are used for the strain matrix, then in any case a nonsymmetric matrix is assumed. Also, for free-standing structures, the strain matrix is nonsymmetric. Dot calculations calculations for strain (4nm_dot.in with finest grid). So what is interesting is the fact that the final residual is always less than the one specified as the actual residual. But the BiCGSTAB routine leaves without errors of convergence. As a conclusion the residual should be (at least 1.00d-10) in the input file. Discretize equation twice or use linked list. The thing is that if one uses lists it takes a lot of memory. So now one can choose between CPU time or RAM. and after that the elements from the list are written into a (sparse) matrix. So the equation has to be discretized only once. But this requires more memory (RAM) and can be critical for large simulations. first to count the number of matrix elements to be stored and second to store them. Of course, this will require the double time necessary for discretization. This is related to the strain routine and to the box discretization method of the Schrödinger equations. There are three different Newton method's implemented. 'Newton-1', 'Newton-2', and 'Newton-3'. 'Newton-3' is based on the C++ version of nextnano³. NonLinPoissonStepMax1D/2D/3D is an input quantity that limits the length of the steps so that you do not try to evaluate the function in regions where it is undefined or subject to overflow (used in subroutine linesearch in subroutine newton). dtolmin = 1.0d-2 --> tolmin (in Newton) = tolf*dtolmin ! These values should not be altered. NonLinPoissonStepMaxXD = 1.0d-2 --> in Newton ! These values should not be altered. alf = 1.0d-4 --> in Newton ! These values should not be altered. NonLinPoissonResidual_actXD ... can be varied in self-consistent calculation. Used for calculating one Newton correction step. NonLinPoissonCGIterationsXD_act ... Values that are actually used. NonLinPoissonCGResidualXD_axt ... Can be varied in self-consistent solution. More information can be found here: nonlinear Poisson equation. It seems that for a classical Double Gate MOSFET simulation, at least in 2D, block-iterative is much faster than couple-all-false. for solving current-Poisson equation: solve linear system Ax=b for x.
CurrentPoissonIterationsXD --> Maximum number of iterations. CurrentPoissonResidualXD --> Precision for solution of current and Poisson equation. In the current equation, for a fixed electrostatic potential the Fermi levels for electrons and holes are solved. With these new Fermi levels, the mobility, the recombination and generation rates, and the electron and hole densities are calculated anew. Then the new Fermi levels are calculated until self-consistency is achieved. The maximum number of iterations for this self-consistency loop can be adjusted as well as the relaxation parameter w that relaxes the quasi-Fermi levels in each iteration step k.
choosing current-block-relaxation-Fermi = 0d0 is not really a good idea. CouplCurrentPoissonStepMax1D/2D/3D is an input quantity that limits the length of the steps so that you do not try to evaluate the function in regions where it is undefined or subject to overflow (used in subroutine linesearch in subroutine newton). CouplCurrentPoissonResidual_act1D/2D/3D ... can be varied in self-consistent calculation. Here one can specify the method of the current calculation. Note: When solving the current equations one takes the Fermi levels from MODULE fermi_level and calculates the relevant densities on that basis. The result is a new Fermi level. The potential is kept fixed throughout the whole procedure. b) 1D/2D/3D: using a LAPACK (solve-for-Fermi-LAPACK, 1D only) or conjugate gradient algorithm (solve-for-Fermi-cg). Here, the drift-diffusion equation is solved by discretizing for the Fermi levels, while considering the electron and hole densities to be constant in each iteration step. The electrostatic potential is kept constant until convergence of the current equation is obtained. This loop is iterated CurrentProblemIterations1D/2D/3D times, its default value is CurrentProblemIterations1D/2D/3D (default: 5 (1D) / 1 (2D/3D)). This flag is used in the current routine (SUBROUTINE solve_current_problem) where the quasi-Fermi levels are kept fixed (usually called 'block-iterative'). Iteration steps for conjugate gradient method for solution for Fermi level. Default value for residual is CurrentProblemCGResidual1D/2D/3D = 1.0d-14. LAPACK-ZHEEVR = ZHEEVR from LAPACK package (calculates selected eigenvalues faster than LAPACK-ZHEEVX). ~10 times faster than ARPACK but this depends a lot on the size of the matrix and on the number of requested eigenvalues, and for setting the correct energy range (cutoff). You will have to specify a cutoff. Only for extreme eigenvalues if inner eigenvalue H2 is diagonalized. Note: FEAST requires an upper limit where to search for eigenvalues, similar to 'chearn'. In 1D, LAPACK is default (which is fine for small matrices dim < 1000), in 2D/3D ARPACK is default. The fastest results are obtained with chearn provided that the user sets the cutoff energy appropriately. schroedinger-1band-residual = 1.0d-12 ! 3D It seems that 1.0d0-12 is better than 1.0d-10 in order to resolve degenerate eigenvalues. If n eigenvalues are required, then ARPACK is asked to calculate n + delta_num_ev eigenvalues. This does not apply to any any other solver. epsilon_ev_rel_to_precision --> From outer iteration the actual relative precision for the potential is known. Hint: When magnetic field is switched on (only 2D and 3D), the 1-band Schrödinger equation is solved with a complex eigenvalue solver. However, if the magnetic field strength is zero, all imaginary entries are zero. In that case, a real eigenvalue solver would be faster. Exactly, the same applies for the superlattice option. You could specify "magnetic-field-on = yes" and "magnetic-field-strength = 0.0d0" (keyword $magnetic-field) in order to solve the 1-band Schrödinger equation with the complex method rather than using the real solvers. Relative cutoff for Chebychev-Arnoldi eigenvalue solver in units of [eV]. Reference is the minimum band edge for electrons and the maximum band edge for holes. Note: This parameter is also necessary for the FEAST eigenvalue solver. Essentially, one has to tell the eigenvalue solver to in which energy interval [Emin , Emax] the eigenvalues are sought. Note, for 6-band k.p in 2D and 3D it is recommended to use ARPACK. In 1D, LAPACK should be used in all cases unless the matrices are larger than dimension = 1000. The fastest results are obtained with chearn provided that the user sets the cutoff energy appropriately. Note that chearn does not work for 8-band k.p where interior eigenvalues have to be calculated. Set to a default value, does not change during simulation. NOTE: All eigenvalues around E_separate are calculated due to H --> H-E_separate. For electrons, however, one only needs eigenvalues above this edge (holes: below). --> Number of eigenvalues is multiplied with a factor mult_num_ev_arnoldi and only the relevant eigenvalues are taken. mult_num_ev_arnoldi here is just a default value, it is specified in each k.p region. If the calculated eigenvalues are not sufficient --> mult_num_ev_arnoldi (in the k.p region) is increased by add_num_ev_arnoldi, otherwise decreased by dec_num_ev_arnoldi. --> disturb_arnoldi is added to diagonal elements of the upper block in order to destroy the symmetry. schroedinger-kp-discretization = box-integration ! 1D/2D/3D (default) Here, the output is with respect to heavy hole, light hole and split-off hole basis (HH LH SO). = box-integration-XYZ ! 1D/2D/3D Here, the output is with respect to XYZ basis. Switch between box integration and finite differences discretization of k.p Schrödinger equation (similar to 1-band Schrödinger equation). We strongly recommend box-integration. Finite-differences seems to be not fully reliable. For box-integration, the k.p Hamiltonian is set up with respect to the XYZ crystal coordinate system. It is then rotated into the heavy hole, light hole and split-off hole basis, and then the eigenvalues are calculated. For box-integration-XYZ, the k.p Hamiltonian is set up with respect to the XYZ crystal coordinate system. Then the eigenvalues are calculated. The eigenvalues and square of the wavefunctions are identical for both methods. The spinor components are different, however. = 1.0d-16 ! 3D ??? Maybe introduce later a variable for these that change during execution. This feature is useful if one has a superlattice and wants to have periodic boundary condtions for the Poisson equation as well. It currently only works in 1D and 3D if the Poisson equation is solved over the whole device, i.e. contacts ($poisson-boundary-conditions) are not allowed. In 1D the Poisson problem is scaled by 1.
both sides (i.e. PoissonM and bV) are scaled by a factor about 10-22 in 3D (2D: 10-12). We have noticed that the conjugate gradient method in templates does not work well within that regime. Therefore both sides are scaled by a factor ScalePoisson3D. To be specific, all elements of PoissonM and bV are scaled AFTER definition of Dirichlet boundary conditions in subroutine scale_poisson. ScalePoisson3D=1d18 has been proved to be adequate in 3D (2D: 1d9). This value should not be altered. Note: Aymerich-Humet and vanHalen-Pulfrey are not implemented any more, so Trellakis is the default. Goano is possible, however. = vanHalen-Pulfrey ! ='2' van Halen, Pulfrey: Uses approximations as documented in MODULE fermi_functions. In case no approximation exists, 'Goano' is taken with FermiFunctionPrecision1D/2D/3D. These Fermi-Dirac integrals include the Gamma prefactors of the Fermi-Dirac integral. Using this specifier, one can define a customized function that defines the electrostatic potential phi. This electrostatic potential is subtracted from the conduction and valence band edge profiles. The variables x, y, z refer to the grid point coordinates of the simulation area in units of [nm]. If you use potential-from-function = "...", you typically want to calculate the wave functions in a particular potential landscape. For this, additionally, you need. This might be helpful in rare cases to improve the convergence of the initial Poisson equation. By default, this flag is ignored. An initial guess for the electrostatic potential phi(x)is calculated automatically taking into account doping properties. If this flag is present, then instead, the initial guess for the electrostatic potential is set to phi(x) = initial-potential. If you read in raw data (e.g. the potential) from a sweep-step or not, then initial-potential is ignored in any case because you read in a previously calculated potential rather than calculating it from scratch. If you start a simulation, first the built-in potential is calculated for the equilibrium, called built-in potential, then voltage is applied with the built-in potential as starting value to determine the potential in nonequilibrium. So the initial-potential is just relevant (as a starting guess) to calculate the built-in potential, after that it doesn't have any influence. because it holds for the resulting conduction band edge Ec(x) = Ec,0(x) - phi(x). The band edge is calculated taking into account that the Fermi level is located at 0 eV. Using zero-potential = yes omits the first calculation of the Poisson equation (which is solved without quantum mechanics, i.e. classically) which is used to obtain an initial guess for the electrostatic potential. This is useful for e.g. - One can set the electrostatic potential to zero and then calculate the eigenstates with flow-scheme = 3, i.e. if one is interested in solving the Schrödinger equation only once and without self-consistency. - For testing and debugging purposes, e.g. testing the eigenvalue solvers. Calculate built-in potential quantum mechanically directly after it has been calculated classically. The following only applies to 8-band k.p where the interior eigenvalues of the energy spectrum are sought. In almost all cases, one is only interested in the energies around the band gap, i.e. only a few electron levels and only a few hole eigenvalues are needed. Therefore, one is using fast eigenvalue solvers such as ARPACK that pick out the relevant eigenvalues around the band gap. The eigenvalue solver then needs the information at which energy the eigenvalues shall be calculated. In most cases, we have the information where in the device the conduction band edge Ec(x) has a minimum and where the valence band edge Ev(x) has a maximum. Note that the position x might not be identical for MIN(Ec) and MAX(Ev). So we can tell the eigenvalue solver to search for energies around the middle of the band gap, i.e. Eseparate = (Ec - Ev) / 2. Then all eigenvalues that are larger than Eseparate are electron eigenvalues and those that are smaller in energy are hole eigenvalues. The actual value of Eseparate influences the CPU time for finding the eigenvalues. Note that the Hamiltonian is solved twice. First, one determines the electron eigenvalues, and then the hole eigenvalues. Specifies where between conduction and valence bands, i.e. typically within the band gap, the separation energy E_separate should be located. e.g. SeparationEnergyShift = 0.1 means that E_separate is (0.1 * band gap) below the lowest conduction band energy (or above the highest valence band for holes). This energy is used for the shift-inverse ARPACK eigenvalue solver. Note: The implementation is different for type-II heterostructures. e.g. separation-energy-shift-eV = 0.1d0 means that E_separate is at 0.1 eV. Essentially, this parameter tells the eigenvalue solver where to look for eigenvalues, e.g. Note: The flag separation-energy-shift-eV might be useful for type-II heterostructures where electron and hole eigenvalues might overlap. Note: If separation-energy-shift-eV is not equal to zero, then this separation energy will be used. If it is equal to zero, then the other model (described above) using a factor for the separation energy is used (separation-energy-shift). If effective mass is isotropic (at Gamma point: conduction band and heavy, light and split-off hole band) then the mass tensor is diagonal in any coordinate system. So one needs only pure derivatives for discretization (dx2,dy2,dz2). If mass is anisotropic (L point, X point), one needs also mixed derivatives (dx dy, dx dz, dy dz). The mass tensor can become anisotropic when strain is applied. In the case of  quasi-homogeneous strain, mass tensor will be anisotropic, but still diagonal in the calculation system, so one doesn't need schroedinger-masses-anisotropic = yes. In the case of arbitrary grown strained structures hole effective masses are nondiagonal in the calculation system. For this we need schroedinger-masses-anisotropic = yes. schroedinger-masses-anisotropic = yes does not support periodic boundary conditions so far. use-band-gaps = yes ! Use band-gaps and bow-band-gaps. This flag specifies which option should be used. varshni-parameters-on = yes ! Temperature dependent energy gaps. = no ! Band gaps independent of temperature. Absolute values from database are taken. Varshni parameters are used to determine temperature dependent energy gaps (i.e. temperature dependent conduction-band-energies). lattice-constants-temp-coeff-on = yes ! Temperature dependent lattice constants. = no ! Lattice constants independent of temperature. Absolute values from database are taken. The coefficients are used to determine temperature dependent lattice-constants. Note the primes on the 8-band k.p parameters which distinguish them from the unprimed 6-band k.p parameters. nextnano³ provides the user full flexibility to input the k.p parameters. For 6-band k.p, the user can either use the the LMN parameters (default) or the Luttinger parameters gamma1, gamma2, gamma3 (Luttinger-parameters = 6x6kp). For both choices, the kappa parameter can be used or not. In the latter case (default), it is calculated automatically. The 8-band k.p parameters depend on the band gap Egap. For 8-band k.p, the user can either use the values listed in 8x8kp-parameters (default), or calculate the 8-band k.p parameters from the 6-band k.p parameters (recommended). In this way, the temperature dependent band gap Egap is automatically taken into account. This is important, as L', N', kappa' (or gamma1', gamma2', gamma3', kappa') and S depend on the band gap. The B parameter is used in any case. The user can either use the S parameter specified in 8x8kp-parameters (default) or calculate this parameter from the conduction band electron mass (recommended). Kane's momentum matrix element Ep is usually given in units of [eV] (default) or [eV Angstrom]. This choice affects the value of Ep in 8x8kp-parameters. The Luttinger parameters are called gamma1, gamma2 and gamma3 and are typically given for a 6-band k.p Hamiltonian. There are additional Luttinger parameters called kappa and q. q is not implemented yet. Luttinger-parameters = 6x6kp (or) yes ! Use database entries Luttinger-parameters = gamma1 gamma2 gamma3 ---. = 6x6kp-kappa ! Use database entries Luttinger-parameters = gamma1 gamma2 gamma3 kappa. = 6x6kp-kappa-only ! Use database entries Luttinger-parameters = --- --- --- kappa, and L, M, N (or L', M', N') parameters. = 8x8kp ! Use database entries Luttinger-parameters = gamma1' gamma2' gamma3' ---. Note: Here, modified (i.e. 8-band k.p) Luttinger parameters have to be specified. = 8x8kp-kappa ! Use database entries Luttinger-parameters = gamma1' gamma2' gamma3' kappa'. Note: Here, modified (i.e. 8-band k.p) Luttinger parameters have to be specified. = 8x8kp-kappa-only ! Use database entries Luttinger-parameters = --- --- --- kappa', and L, M, N (or L', M', N') parameters. Note: Here, the modified (i.e. 8-band k.p) kappa parameter has to be specified. = no ! default, i.e. use L, M, N (or L', M', N') parameters. This flag can be used to take from the database (or input file) the Luttinger parameters (gamma1, gamma2, gamma3, i.e. Luttinger-parameters, and optionally also kappa) instead of the DKK notation (L,M,N, i.e. 6x6kp-parameters and 8x8kp-parameters). This flag currently only works for zinc blende. In the default database, the Luttinger parameters are defined for 6-band k.p. i.e. not for 8-band k.p. 8x8kp-params-from-6x6kp-params = LMNS (or) yes ! Calculate L',M'=M,N',S. Note: S is calculated from Egap, Deltaso, EP and me. = LMN ! Calculate L',M'=M,N'. Note: S is taken from database entry. For 8-band k.p one can alternatively specify the modified Luttinger parameters gamma1', gamma2', gamma3' directly if Luttinger-parameters = 8x8kp or = 8x8kp-kappa is used. In wurtzite, the "Luttinger" parameters are called Rashba-Sheka-Pikus parameters. This is used by default in wurtzite.
! We will now treat the different options that could be present in the input file, i.e. = LMNS (or) yes ! Calculate L',M'=M,N',S: Note: S is calculated from Egap, Deltaso, EP and me. = S ! S is calculated from Egap, Deltaso, EP and me. no: Don't calculate 8-band k.p parameters from 6-band k.p parameters. Take 8x8kp-parameters from database or input file (L',M'=M,N',S). LMNS: Calculate 8-band k.p parameters from 6-band k.p parameters (L',M'=M,N',S). Don't take 8x8kp-parameters from database or input file (apart from B, EP). Note: S is calculated from Egap, Deltaso, EP and me. LMN: Calculate 8-band k.p parameters from 6-band k.p parameters (L',M'=M,N'). Don't take 8x8kp-parameters from database or input file (apart from B, EP, S). Note: S is taken from database and is not calculated. S: S is calculated from Egap, Deltaso, EP and me. Don't take 8x8kp-parameters from database or input file (apart from L',M'=M,N',B, EP). These flags will overwrite 8x8kp-parameters (L',M',N',S or L',M',N') from database or input file by calculating them from 6x6kp-parameters (L,M,N,Egap,Deltaso,EP,me). Note: This flag currently only applies to zinc blende and wurtzite with quantum-model "8x8kp". Sometimes it might be necessary to rescale the 8-band k.p parameters in order to avoid spurious solutions, see eq. (3.158) and eq. (3.159) in the PhD thesis of S. Birner. no: Don't rescale 8-band k.p parameters (default). ONE: Rescale 8-band k.p parameters so that S=1. This affects S,EP,L',N',N+',N-' that are calculated anew. ZERO: Rescale 8-band k.p parameters so that S=0. This affects S,EP,L',N',N+',N-' that are calculated anew. This flag will overwrite the 8-band k.p parameters (L',N',N+',N-',EP,S) by rescaling them to fit S=1 or S=0. This is sometimes necessary to get rid of spurious 8-band k.p eigenfunctions. Obviously, rescaling so that S=1/S=0 affects the eigenvalues of the electrons more than the eigenvalues of the holes. Option ZERO: In this case, spurious k.p solutions are avoided in any case (but this argument only holds for the k space and not for a real space discretization with grid spacing Deltax where kmax = 2pi /Deltax. This corresponds to the situations that remote-band contributions cancel the free-electron term. It is likely that one still gets spurious solutions in the conduction band. Option ONE: In this case, spurious k.p solutions are avoided in most cases. This corresponds to entirely neglecting remote bands. This is the default setting in the nextnano++ software. Refers to EP parameter specified in 8x8kp-parameters in input file or database. All parameters in the database are EP. If the users prefers P instead, he is welcome to do so by using this flag. This works for both zinc blende and wurtzite. The valence band effective masses for heavy hole, light hole and split-off hole are calculated from the L, M and N parameters (Dresselhaus notation) given in the database for each material (6x6kp-parameters) considering strain effects. Through this, one has the option to calculate effective masses of holes, depending on k.p parameters and strain and then compare single-band Schrödinger results ('quantum-model-holes = effective-mass' and using effective masses derived from k.p and strain) with "6x6kp" calculation for instance. cv is related to the Hcv part of the k.p Hamiltonian. vv is related to the Hvv part of the k.p Hamiltonian. Here one can choose between two methods of discretizing the k.p Hamiltonian, a symmetrized and a nonsymmetrized k.p Hamiltonian. The symmetrized Hamiltonian is based on the bulk k.p Hamiltonian, whereas the nonsymmetrized version is based on Burt's k.p formulism for heterostructures (see also Foreman, Elimination of spurious solutions from eight-band kp theory, PRB 56, R12748 (1997) or M.G. Burt, Fundamentals of envelope function theory for electronic states and photonic modes in nanostructures, J. Phys. : Condens. Matter 11, R53 (1999)). Note: These two Hamiltonians are different only for heterostructures. For bulk structures with infinite barriers (e.g. GaN or Si nanowires), they are identical. Only the nonsymmetrized Hamiltonian corresponds to the correct physics for heterostructures. Typically, in the physics literature, the spin is quantized with respect to the z direction. In a numerical calculation using the nextnano software, the user might want to define a different direction, e.g. if the quantum well is grown along the x, y or z direction. By default, the program uses a default direction for the spin quantization depending on symmetry and/or growth direction. This flag is relevant for the k.p Hamiltonian where the basis is defined with respect to a particular axis of spin quantization. Depending on the choice of quantization-axis-of-spin, the respective unitary transformation is performed. Currently, this flag is only used within box-integration routine but not within finite-differences. For finite differences, spinors are rotated afterwards (post-processing), see SUBROUTINE rotate_spinor_calculation2sim. In 1D, a simulation can be along the x, y or z axis of the simulation coordinate system. We consider the quantization axis of spin to be parallel to the simulation axis for a 1D simulation. if the quantization axis of spin is parallel to the growth direction which is the simulation direction. This is here taken into account automatically. However, the situation is different for a quantum well simulated in a 2D or 3D domain. In this case, the quantum well can be oriented along the x, y or z axis. The program does not know this. A possible solution could be to use the growth direction, 'growth-coordinate-axis', as a means to determine the quantization axis or angular momentum. So far, it is the z axis for a 2D and 3D simulation. In a 1D simulation, this z axis is adjusted automatically to x or y, if the simulation is along x or along y. For the k.p Hamiltonian, different bases can be used. For details, see e.g. the book of L. C. Lew Yan Voon, M. Willatzen, The k.p Method (2009) [VoonWillatzen] (e.g. Section 3.3.1.1). The differences are due to zinc blende vs. wurtzite symmetry and due to the phase factors which can be defined differently (see Table C.2). This flag only makes sense for schroedinger-kp-discretization = box-integration. The cartesian (S,X,Y,Z) and the angular momentum states (S,|J,m>) basis sets are related by a unitary transformation, see also Section 3.3.1.1 in [VoonWillatzen]. - One can define a 6x6 matrix that transforms from |X+>,|Y+>,|Z+>,|X->,|Y->,|Z-> basis to the angular momentum |J,m> basis. - One can define an 8x8 matrix that transforms from |S+>,|S->,|X+>,|Y+>,|Z+>,|X->,|Y->,|Z-> basis to the angular momentum |J,m> basis. When is this basis used? The nextnano software defines the k.p Hamiltonian and its parameters always with respect to the SXYZ basis where the spin quantization axis is assumed to be along the cartesian z direction. There are several rotations involved, e.g. if the crystal is rotated with respect to the simulation coordinate system or if the simulation is performed along the x, y or z direction. The k.p matrix in the SXYZ basis can be transformed to another angular momentum basis before the eigenvalues are calculated. schroedinger-kp-discretization = box-integration ! Transform SXYZ Hamiltonian into angular momentum basis before the eigenvalues are calculated. Eigenfunctions are then defined with respect to basis specified in schroedinger-kp-basis. = box-integration-XYZ ! Use SXYZ Hamiltonian. Eigenfunctions are defined with respect to SXYZ basis. The numercial speed of the iterative eigenvalue solver depends on the basis used. Once the eigenfunctions are known, they can be transformed to any other basis of interest. - single-band Schrödinger equations for the holes. Here, for each grid point, the strain-dependent 6-band k.p Hamiltonian is solved at k = (kx,ky,kz) = 0 (Gamma point). The resulting eigenvalues are known as heavy hole, light hole and splif-off hole. They represent the valence band edge energies for the single-band Schrödinger equation for each hole band. The challenge is to determine which eigenstate is light hole and which eigenstate is crystal-field hole for wurtzite. Therefore, we implemented several methods to test each method. calculate-bandedge-energies = vb-method-1 ! (default) (method implemented by M. Povolotskyi for zincblende, generalized by S. Birner for wurtzite) - This is the default since 2013-09-17. = vb-method-2 ! (method implemented by M. Povolotskyi for zincblende and the method of M. Sabathil generalized by S. Birner for wurtzite) - implemented since 2013-09-17. = vb-method-3 ! (method implemented by M. Povolotskyi for zincblende and the method of M. Sabathil for wurtzite (which is actually a zincblende version) - This was the default until 2013-09-17. = vb-method-4 ! (method implemented by M. Sabathil for zincblende and the method of M. Sabathil for wurtzite (which is actually a zincblende version) - This was the default a long time ago. "k.p theory of energy bands, wave functions, and optical selection rules in strained tetrahedral semiconductors"
then one has to perform a transformation k' = (1 - eps)k.
eps is du/dr and not just the symmetric part of it. The flag is to decide if we want to do this transformation or not. The effect is small. And this is good, because if it were big that would mean that the method cannot be applied. = full-band-density ! FB-EFA: Either $quantum-model-electrons or $quantum-model-holes has to be specified. = full-band-density-electrons ! FB-EFA: The k.p Hamiltonian is solved only once. $quantum-model-electrons has to be specified. = full-band-density-holes ! FB-EFA: The k.p Hamiltonian is solved only once. $quantum-model-holes has to be specified. = full-band-density-electrons-only ! FB-EFA: The k.p Hamiltonian is solved only once. Both $quantum-model-electrons and $quantum-model-holes should be specified. = full-band-density-holes-only ! FB-EFA: The k.p Hamiltonian is solved only once. Both $quantum-model-electrons and $quantum-model-holes should be specified. Error update_kp: Cannot handle conduction band below valence band (E_cond_min < E_val_max). can be avoided when using broken-gap = yes or broken-gap = full-band-density. This error appears when the lowest conduction band edge value is lower than the highest valence band edge, i.e. a negative band gap is present. In this case the code does not know how to distinguish between electron and hole states in an 8-band k.p approach. The density can be calculated using broken-gap = full-band-density. This approach is termed FB-EFA (full-band envelope-function approach). To allow for piezo and pyroelectric charges at the boundaries. Usually nextnano³ sets the piezo and pyroelectric charges to zero at the boundaries of the device. If one assumes that one only simulates a small part of the device (as is the case for most situations) one does not have an interface at the boundary (and therefore no charge). If one wants to have an explicit interface at the boundary (because the device has a boundary there), one has to define a material-air interface in the input file. Alternatively one can use this option. The corresponding charges can be looked up in the output file interface_densitiesD.txt ($output-densities). This option might be useful for wurtzite (pyroelectric charges) and strained zinc blende structures grown along other directions than  or  where there is a nonzero piezoelectric polarization P at the boundary. In vacuum P = 0. Therefore, there is div P nonequal to zero at the surface. To set the piezo any pyroelectric constants (piezo-electric-constants, pyro-polarization) from the database (database_nn3.in) or input file to zero. This option is useful to study the effects of piezo and pyroelectric charges in wurtzite independently. It is also useful for strained structures in order to understand the influence of strain much better. Here, one can switch on the second order effect of piezoelectricity. Obviously several piezoelectric parameters are needed. Note: In the simulated structure, a mixture of zinc blende and wurtzite materials is allowed. This is the model supported by the database_nn3.in file, i.e. these parameters can be specified in the database or in the input file. - For zinc blende materials the 2nd order model of A. Beya-Wakata et al., Phys. Rev. B 84, 195207 (2011) is used. - For wurtzite materials, the 2nd order model of L. Pedesseau et al., Appl. Phys. Lett. 100, 031903 (2012) is used. - For zinc blende materials it is identical to 2nd-order. Additionally, it is identical to 4th-order-Tse-Pal if one neglects 3rd and 4th order terms. Note that the Tse-Pal model assumes B114 = e114, B124 = e124 and B156 = e156 = 0. - For wurtzite materials, the 2nd order model of J. Pal, G. Tse et al., Phys. Rev. B 84, 085211 (2011) is used. 6 parameters are needed. See also H. Y. S. Al-Zahrani et al., Nano Energy 2, 1214 (2013). The wurtzite material parameters for this model can only be specified in the input file but not in the database file database_nn3.in. The material parameters for this model can only be specified in the input file but not in the database file database_nn3.in. - For zinc blende materials the model of G. Tse, J. Pal et al., J. Appl. Phys. 114, 073515 (2013) is used. It includes linear terms, 2nd, 3rd and 4th order terms for zinc blende. - For wurtzite materials it is identical to 2nd-order-Tse-Pal. For the single-band Schrödinger equation in 1D and 2D, we need a parallel effective mass to calculate the quantum mechanical charge density. At material interfaces, this parallel effective mass is not continous (because the materials have different effective masses) which will lead to a discontinuity in the quantum mechanical charge density. By default, we use an averaged parallel effective mass value which is weighted by the parallel effective masses at each grid point and the square of the wave function psi² at each grid point (FUNCTION get_mass_par_averaged). This will lead to a contious quantum mechanical charge density. However, especially in 2D this could lead to an enormous increase in CPU time, especially if lots of eigenvalues are specified. Therefore the user can allow for discontinous parallel effective masses (and thus a discontinous quantum mechanical charge density) to speed up the calculations. 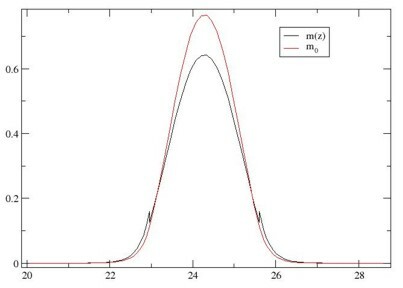 The figure on the left shows the quantum mechanical charge density of a 1D quantum well for the case of discontinous-charge-density-1band = yes. The discontinuity in the parallel effective masses m(z) at material interfaces leads to a discontinuity in the quantum charge density at interfaces. The right figure shows (for a different quantum well!) a comparison of the two approaches. The red line uses an averaged parallel effective mo mass which leads to a continous quantum charge density (discontinous-charge-density-1band = no). The x axis corresponds to the position in nm, the y axis to the charge density in |e| * 1 * 1018 cm-3. or along special directions in the superlattice Brillouin zone. Note that the directions refer to the simulation coordinate system and not to the crystal coordinate system. Internally, only positive KSL values are calculated. no: Program will not save wave functions for KSL vectors. Usually one is interested only in the eigenvalues and not so much in the wave functions itself. This option is necessary to avoid huge memory allocation, e.g. especially in 3D for option whole. Calculates exchange and correlation potentials as a functional of the density in LDA or LSDA. Depending on the type of polarization ([ unpolarized (LDA) , polarized (LSDA) ]), different sets of parameters have to be used. To output Coulomb energy (= Hartree energy) only (does not work yet). 3D: To calculate exciton energy of electron and heavy hole state self-consistently (Hartree approximation only). It is also possible to calculate the exction energy of electron and light hole, or electron and split-off hole. Note: For self-consistent Kohn-Sham eigenvalue problem, exiton-iterations must be set too a much higher value (!). - Calculate exciton energy of the electron ground state with the hole ground state. - Calculate exciton energy of the 2nd electron state with the hole ground state. - Calculate exciton energy of the electron ground state with the 2nd hole state. - Calculate exciton energy of the 2nd electron state with the 2nd hole state. Note: The numbering of k.p states is twice as many as single-band because spin up and spin down states are included. Example: The 1st k.p hole state corresponds to the 1st single-band holes state. The 3rd k.p hole state corresponds to the 2nd single-band holes state. The 5rd k.p hole state corresponds to the 3nd single-band holes state. In 2D, these two specifiers specify the number of electron and hole states that are considered for the wave function expansion, i.e. 3 means 1 electron ground state and 2 excited electron states and similar for the holes. In 1D we currently have a routine that calculates the exciton correction in type-I quantum wells (single-band only, suited for electron and hole ground states only). It contains information on the exciton binding energy (in units of [meV] and [Rydberg]) and on the exciton Bohr radius (which is the variational parameter) in units of [nm]. To speed up the calculations, the user can provide an educated guess for the start value of the variational parameter lambda. In 3D we can calculate the exciton correction in quantum dots taking into account the Coulomb potential (Hartree approximation). This works for single-band Schrödinger equation for both electrons and holes, as well as for 8-band k.p for both electrons and holes. One can also treat the electrons within single-band and the holes within 6-band k.p. E_el0 - E_hl0 [eV]: Transition energy of the original electron state minus the original hole state (without exciton correction), i.e. energy difference between non-interacting electron and hole one-particle states. non-interacting electron and hole one-particle states (E_el0 - E_hl0) and the energy of the exciton state E_ex. E_el0 - E_hl0 [eV]: Transition energy of the original electron state minus the original hole state (without biexciton correction), i.e. non-interacting electron and hole one-particle states 2*(E_el0 - E_hl0) and the energy of the biexciton state E_biex. Note: There might be problems with the current nextnano³ implementation of the exciton routines for electrons at other valleys than Gamma (due to degeneracies, splitting of bands) or for the light holes (single-band approximation). The units are [eV]. 16 parameters are required for zinc blende materials. 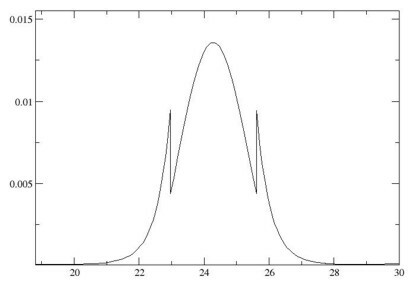 E2p or gamma1 can be calculated internally in order to force E(K) = 0 eV where K is the K point in the Brillouin zone. In that case, only 6 parameters are used (although 7 parameters have to be present in the input file). The parameter to be calculated is simply ignored inside the code. = 0.100d0 0.001d0 3d0 ! [eV] [eV]  These are useful values, especially the latter two for CPU efficiency. For Dirac point potential fluctuation see H. Xu et al,. APL 98, 133122 (2011). We assume a Gaussian distribution of the potential fluctuation. The 1st value of these array entries corresponds to the fluctuation in potential energy of the Dirac point in units of [eV]. Useful values lie in the range from 0 eV to 0.200 eV. The 2nd value of these array entries (optional) corresponds to the energy grid resolution of the Gaussian integration in units of [eV]. The 3rd value of these array entries (optional) is related to the integration range of the Gaussian integration in units of . The integration range is from [ - sigma_factor * PotentialFluctuation , + sigma_factor * PotentialFluctuation ] [eV]. Adjusting the 2nd and 3rd value has implications on CPU time. 3d0 is a very reasonable value for sigma_factor and also an energy grid resolution of 1 meV (0.001d0) is sufficient. For more details, see Matthias Sabathil's documentation of CBR_example, page 4 ("Lead modes").